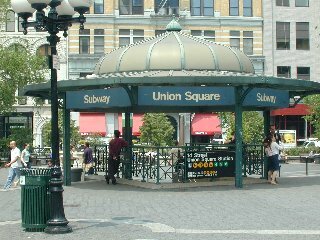 Get off at 49th Street (which is not as disgusting as Union Square). Walk one block to office. but today was not routine…. Yes I woke up in Queens – Queens Plaza. I got my $2 worth. Walk across subway track and head back to 49th street. « Will the real George W. Bush please…..
Now I have the ‘don’t sleep in the subway’ song stuck in my head. Crap. I’ll be humming it in my sleep. I’ll get you back one day for that. when i was a kid and we would go to the city, riding the subway was one of the most thrilling things in the world to me. and, thanks, diane. now i have the damned song running around in my brain! Sometimes I miss the subways. Not often, though.They were good for reading, and it’s true, they can rock you to sleep like no other form of transportation. QP baby!! Wow. That is almost my old commute in reverse. And taking the N,R or Q uptown reminds me of coming up there to meet you for sushi lunches.Speaking of which I have called and emailed Jax but no reply. Have you heard from her? Oops!You didn’t wake up across from a naked guy, then decide to go to Coney Island like Seinfeld, did you? I grew up near Boston and remember taking the T in to go shopping with my grandmother or to an event (circus, Ice Capades) at the old Boston Garden. Those subways were far dirtier and creepier than the NYC subways I rode in early 2002. The Manhattan subways were nearly spotless, well-lit, they didn’t smell bad, and I never was in fear for my safety. I was actually a little disappointed. 500 rides a year?You never walk? All those long, flat streets that run north/south and all there is to see, plus the cardio benefit.Buy a pair of Nike and walk, boy!It’s good for your heart. Awwww… My boss keeps falling asleep on the train and ending up in weird places.When I am in NYC, I take the F from Bergen Street, Brooklyn to West 4th and then walk to Hudson and Houston Streets. The F is usually too packed to get a seat, so sleeping isn’t an option for me.Oh well. I could be home in Ottawa, which just got 30 centimetres/1 ft. of snow just as its public transit went on strike. Moving to NYC permanently is sounding better and better. Falling asleep in the subway is a testament to how laid back you are.When I was in NYC and rode the subway I was hypervigilant as a speed freak after a 48 hour tweak. 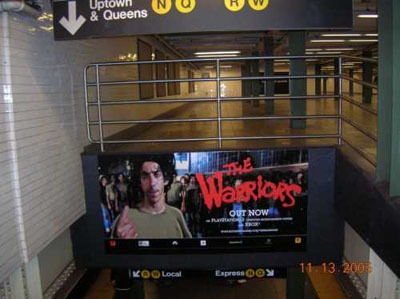 Hi Cap;The picture of the NYC subways I read on these posts are far different than the ones I saw in the movies, where thugs are waiting to get you and in crowded cars old perverts were grabbing the flesh of women who couldn’t turn around to slap them. The Tokyo Subway is crazy. I never travelled there at rush hour, but it was bad enough during the day. ichabod, all those thuggy pervs have been taken care of via dcap’s legendary kung-fu. Too bad NY doesn’t hire people to shove more passengers into the subways like you see in Tokyo. That would just make your morning commute, wouldn’t it? Man, no wonder New Yorkers are a breed apart! I think ONE subway ride would freak me out! oh that is funny…i used to take the G to queensplaza, then the N, R, or the BDFQ (before they switched them all around) to the times square area (I used to work on 46th St – still do, but now I telecommute from AZ), and I over shot my stop more than once…thanks for the memory!! 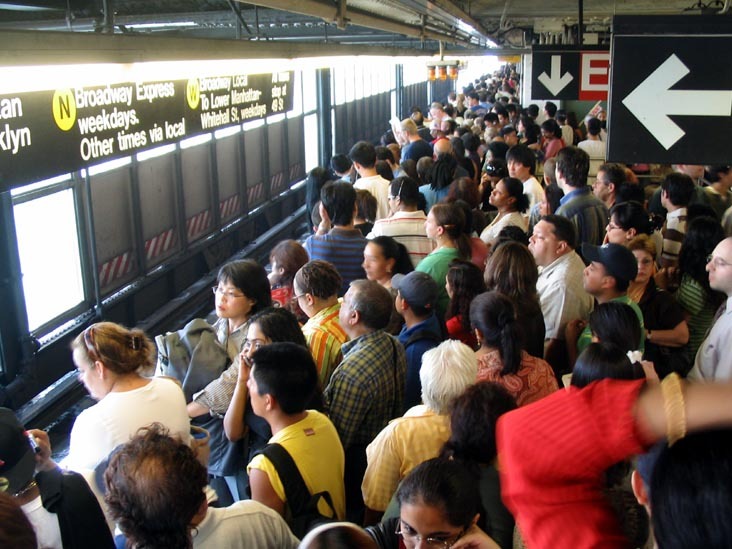 Blogger SkylersDad said… Too bad NY doesn’t hire people to shove more passengers into the subways like you see in Tokyo. That would just make your morning commute, wouldn’t it?Why hire when there are so many volunteers? 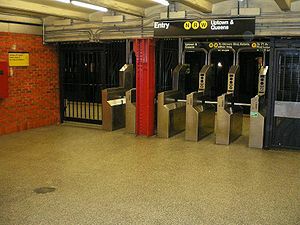 I would like the MTA to hire staff to shove the people out of the way who stand in the doors and block them so that others can’t get in or out. Then they can take on the dreaded “stroller people” who take up half the car during rushhour. Finally they could use cattle prods on the people who hold the doors open so that their slow friends can get in. toujoursdan: I used to work at Hudson and Houston. Loved it because I could walk to work, but then they moved my office a few months ago and now I have to take the subway to work. I wonder if your destination is my former office? DCap: Have you noticed cut backs with the MTA? I definitely see a cut back in the mornings. toujoursdan: I used to work at Hudson and Houston. Loved it because I could walk to work, but then they moved my office a few months ago and now I have to take the subway to work. I wonder if your destination is my former office?DCap: Have you noticed cut backs with the MTA? I definitely see a cut back in the mornings.December 10, 2008 10:18 PMMaybe. I am in the Saatchi and Saatchi (sp?) building. It’s a nice walk but wish there were more amenities here, i.e. a pharmacy and grocery store. Yes, that song is now stuck in my head too. LOL about falling asleep and waking up in Queens. When I was in my teens I remember once my father (who took a bus home from the city every night from work) fell asleep on the bus and woke up about two towns farther over on the route. My mom had to go pick him up. I used Bahston’s transit system for five years. I loved it..except for the time this small child tried to pick pocket my purse. 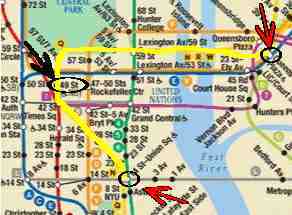 I have also used the subways in DC, San Fran and Hell-A. Beantown’s was the best for service by far of the four I have used. Oh shoot… I’m sorry I missed this… but it’s probably not as bad as you missing your stop.